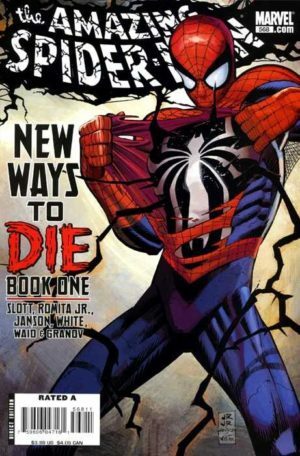 The Spider-Man comic books definitive issue-by-issue collecting guide and trade reading order for omnibus, hardcover, and trade paperback collections. Find every issue and appearance! Part of Crushing Krisis’s Crushing Comics. Last updated November 2018 with titles scheduled for release through April 2019. Looking for Miles Morales, Spider-Man? He has his own guide! There is no hero more synonymous with Marvel Comics than Spider-Man. Over fifty years of comic books focused on just one hero means there are many great Spidey stories out there to read – so many, in fact, that it is hard to know where to begin or what order they should be read in. Add to that the gradual appreciation of back issues, and for a new fan it might seem like enjoying Spider-Man is an insurmountable task. Luckily, the vast majority of those comics have been collected into dozens of softcover graphic novels, called “trade paperbacks,” and the issues they contain fall into a discernible reading order. This page covers all of them – every issue, every collection – close to every appearance. If you want to figure out the best way to read Spidey, this page is your headquarters. Marvel Masterworks: Sequential, premium-format color collections of early issues of Amazing Spider-Man and Marvel Team-Up. The 80s – A Tangled Web: Amazing, Spectacular, Team-Up, and Web of Spider-Man. Want to read Spider-Man comics cheaply and in black & white? Marvel’s Essentials line packs tons of comics into each phone-book-sized edition. If you don’t care about color and glossy paper, this is the best way to acquire your favorite Spidey stories quickly. Marvel Team-Up launched in March 1972 alongside Amazing Spider-Man #106 as a vehicle for Marvel to use Spider-Man’s popularity to print stories with other – frequently more-obscure – characters. 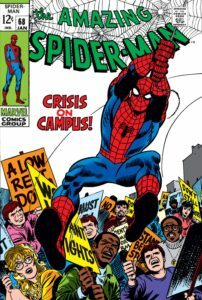 Debuting in December 1976 alongside Amazing Spider-Man #163, Spectacular Spider-Man took its name from a short-lived Spider-Man magazine from the 60s. Web of Spider-Man launched in April 1985 on the heels of Spider-Man’s return from Secret Wars wearing a black suit. It debuted alongside Amazing Spider-Man #263 and Spectacular Spider-Man #101. Have you ever wished you could own an entire series in one consistent, convenient, full-color bookshelf format? Most collectors would scream “YES!” to answer that query, and in 2014 Marvel finally granted their wish with Epic Collections. These are affordable, full-color collections of issues in perfect continuity order without a single gap. The catch? Marvel is releasing them in a random order to focus on the biggest gaps first – since early issues are already well-covered by both Essentials and Masterworks. Marvel Masterworks editions are high quality, full color reproductions of original issues. The volumes were originally released as hardcovers, with many now out of print. The same print sequence of books is now being released as paperbacks. If you decide to buy hardcovers, the newest editions are 2003 or newer, with silver dustjackets. 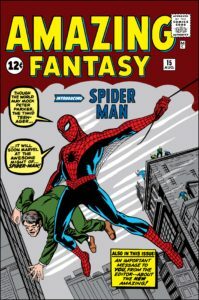 Spider-Man was introduced in the final issue of anthology series Amazing Fantasy in 1962, where his origin as an every-day geek turned crime-fighter via mad science and an unfortunate tragedy captured the imagination of an adoring public. 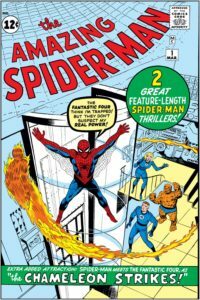 Stan Lee and Steve Ditko quickly debuted him in his own title only a few months later, where his first issue featured a guest appearance from The Fantastic Four! Unlike other pencillers of the time, Ditko’s illustrations of Spider-Man and his gallery of rogues have hardly aged – his iconic early covers depict a bold, lithe version of Spidey that remains relevant to this day. 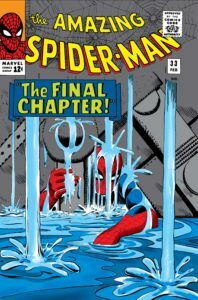 John Romita, Sr. took over art duties with issue #39, and began a run with Lee that would close out the decade and include a series of classic stories still referenced today. 3rd printing. 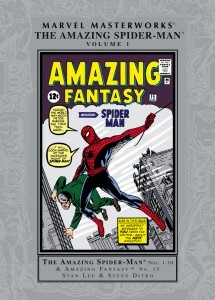 Also collects Amazing Fantasty #15, ASM Annuals 1-2, Fantastic Four Annual 1, and Strange Tales Annual 2. 2016 Reprint. Though written in the 1990s, the stories in this collection run seamlessly alongside Amazing Spider-Man issues #6-23 (exact chronology indicated below in italics). Collects Untold Tales #-1, 1-25, and Annuals 1996 and 1997. Also collects Amazing Fantasy #16-18, and Untold Tales of Spider-Man: Strange Encounters #1 (which is also in Spider-Man/Doctor Strange: The Way to Dusty Death (2017)). Also Collects Annuals 3-5. Reprinted in 2016. If you aren’t looking for a complete run via Omnibus, Masterworks, or Essentials, you can also find selected issues from this run in collections based on certain themes, villains, or artists. 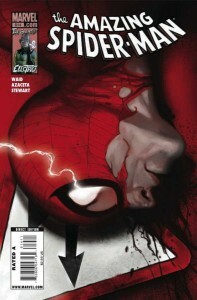 A five-issue 2007 limited series looking at Peter Parker’s life before Spider-Man. 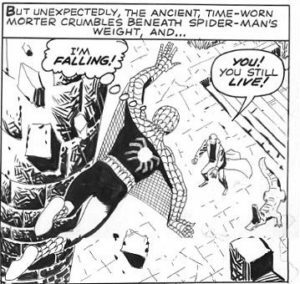 After ASM #5, Spidey appears in Strange Tales Annual 1. Untold Tales of Spider-Man begins after ASM #6. After ASM #7 he appears in Strange Tales #115. Along with many other key Kirby issues, including Avengers #4. #14: Curiously, the first appearance of vintage foe The Green Goblin has not been reprinted in any Goblin-centric TPBs to date! Spider-Man next appears in Tales to Astonish #57. Comes after #28. This volume collects The Amazing Spider-Man (1963) Annual 2-3 & 15, Daredevil (1964) #16-17, Marvel Team-Up (1972) #100, and Spider-Man (1990) #15. Also collected in Spider-Man/Doctor Strange: The Way to Dusty Death (2017). From ASM Annual 2, Spider-Man appears in Fantastic Four Annual #3. Reprints many Ditko classics – including Amazing Spider-Man #1 and Annual 1. 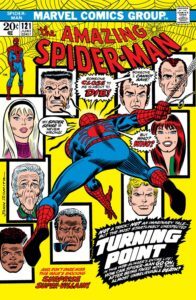 #39-40 & 42: Marvel Visionaries: John Romita Sr. Annual 3: AKA Special #3, comes after ASM #41. After ASM #43, Spider-Man appears in X-Men #27. After ASM #46, he appears in Fantastic Four #61. After ASM #47, he appears in Daredevil #27 and Strange Tales #156. After #49 he appears in Marvel Super-Heroes #14. After ASM #52, Spider-Man appears in X-Men #35. Annual 4: AKA Special #4, comes after ASM #52 and X-Men #35. After ASM #56, Spider-Man appears in Thor #148. After ASM #59, he appears in Fantastic Four #73. 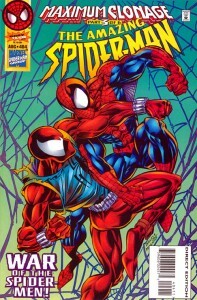 Spectacular Spider-Man Magazine #1 comes after ASM #59 and Fantastic Four #73. #68-69: In both Visionaries: Romita editions, above. After ASM #67, Spider-Man appears in Avengers #59-60. After ASM #71, Spider-Man appears in Sub-Mariner #14. He appears in Daredevil #54 during ASM #75. #82: Collected in Greatest Villains, above. #84: In Romita Artist edition, above. After #85, Spider-Man takes a break to appear in Captain America #130, Silver Surfer#14, and Avengers #82. #86: A key Black Widow issue, it’s collected in her Sting of the Widow hardcover, as well as Women of Marvel TPB, and Black Widow & The Marvel Girls. Spider-Man next appears in Amazing Adventures #3. After #94, Spider-Man appears in Avengers #85, Captain America #137-138, Daredevil #77, and Sub-Mariner #40. The Amazing Spider-Man (1963) #96-98 & 121-122 and Webspinners: Tales of Spider-Man (1999) #1. Also collected in Visionaries: Stan Lee, above. Marvel Team-Up (MTU) debuts in March 1972 alongside Amazing Spider-Man #106 – a title that pairs Spidey with another marquee Marvel character. Typically team-ups last only 1-2 issues. Amazing Spider-Man issues continue to be bolded without any title abbreviation. Spider-Man appears in Fantastic Four #111. 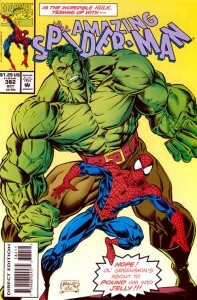 Spider-Man appears in Hulk #152-153 between those issues of MTU, then appears in Marvel Feature #4. Spider-Man appears in Fantastic Four #133 after Marvel Team-Up #8. #121-122: Collected in both Death of the Stacy’s and The Death of Gwen Stacy, each above. Spider-Man appears in Luke Cage #12, and between the next two MTU issues in Daredevil #103. Spider-Man also appears in Avengers #118 after #125, and Sub-Mariner #68-69 after MTU #17. 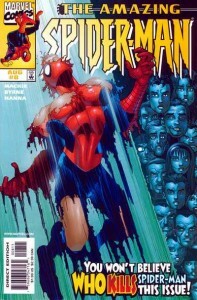 #130-131: Collected in Spider-Man vs. Doctor Octopus, above. Spider-Man also appears in Giant-Size Super-Heroes (prior to MTU #22) and Giant-Size Spider-Man #1 alongside MTU #23. Spider-Man also appears in Giant-Size Spider-Man #2 after MTU #24, and Creatures on the Loose #32 after MTU #25. Collecting The Amazing Spider-Man (1963) #139-150 and The Spectacular Spider-Man (1976) #25-31, 149, 162-163, and Annual 08. #141-150 was previous collected in 1995 as Clone Genesis along with Giant-Size #5. MTU #30-38: Not collected aside from #38 in X-Men Marvel Masterworks, Vol. 8 (except Essentials, above, #32 in Essential Marvel Horror Vol. 1, #33-35 in Essential Defenders Vol. 2). Spider-Man does not appear in #32 or 35. Spider-Man appears in Giant-Size Spider-Man #3 and MTU #30 and after ASM #140; in MTU #31, Giant-Size Spider-Man #4, and Thor #233 after ASM #142; in MTU #33-34 alongside ASM #145-146 and then Giant-Size Spider-Man #5; and in MTU #36-38 after #150. MTU #39-47: Not collected (except Essentials, above, #45 in Essential Killraven, #46 in Deathlok Marvel Masterworks, #47 in Essential Marvel Two-in-One Vol. 1). Spider-Man crosses over to Marvel Two-In-One #17 between #46-47. Collects Marvel Team-Up (1972) #9-11, 48-51, 72, 110, & 145. Also, #50-51 in Spider-Man/Doctor Strange: The Way to Dusty Death (2017). Peter Parker, Spectacular Spider-Man (SpSM) launches in December 1976 alongside ASM #163 and MTU #52. Amazing Spider-Man issues continue to be bolded without any title abbreviation. MTU #52-58 & Ann 1: Not collected aside from #56 in Greatest Spider-Man and Daredevil Team-Ups (except Essentials, above), though #55 appears in Warlock Masterworks and Essentials. Ann 1 continues into #53, which features The X-Men. After ASM #164 & SpSM #2-3, Spidey appears in Ms. Marvel #1 and Marvel Super Special #1. After ASM #166 he appears in Marvel Treasury Edition #13 before SpSm #4-5. After ASM #170 he appears in the modern Doctor Octopus: Negative Exposure mini (collected in TPB), followed by MTU Ann 1 & #53-55, Hulk #248, MTU #56, SpSM #6-8, MTU #57, and Nova #12 – then heading back to ASM #171. After that, he appears in MTU #58, Human Fly #1, ASM #181 (a flashback story), MTU #59-62, SpSM #9-10, MTU #63-64, SpSM #11, MTU #65-70. #172-175 & Ann 11: Not collected. The annual comes first, sequentially. Spidey makes a brief stop in Code of Honor #2 after ASM Ann 11. After ASM #180, Spider-Man appears in Thor #271, SpSM #12-15, MTU #71, SpSM #16-20, and Defenders #61. #181-186: Not collected (except Essentials, above). As noted earlier, #181 falls earlier in continuity. MTU #72-91 & Annual 2: The stories in MTU #79 & 82-85 fit chronologically into the next period. Much of this run is collected outside of Essentials in single issues – #72 in Spider-Man/Iron Man: Marvel Team-Up. #73 in Spider-Man/Daredevil (above), #75 in Claremont/Byrne (above), #76-77in Spider-Man/Doctor Strange: The Way to Dusty Death (2017), #79 in Spider-Man/Sonja She-Devil, #80-81 in Essential Marvel Horror, Vol. 1 and in Spider-Man/Doctor Strange: The Way to Dusty Death (2017) , #86 in Guardians Of The Galaxy: Tomorrow’s Avengers Vol. 02, #89 in Avengers Academy: Arcade Death Game, #90 in Spider-Man: Mutant Agenda, #91 in Ghost-Rider Team-Up. After ASM #185, Spider-Man appears in SpSM #21, MTU #72, SpSM #22-23, ASM #185 2nd story & ASM #186, MTU #73, SpSM #24, MTU #74-78, Godzilla #24, MTU #80-81, Uncanny X-Men #123, MTU #90, Ann 2, & 86-89, Captain America #237, MTU #91, and SpSM #25-31 and the first six pages of #32. Spider-Man appears in Fantastic Four #204 during ASM #190. After ASM #193, Spider-Man appears in Fantastic Four 207 & SpSM #32-34. After ASM #200, he appears in Fantastic Four Annual 14, Uncanny X-Men #135 (cameo), SpSM #35-37, MTU #92, Spider-Woman #20, MTU #93-95, Captain America #250, ASM Ann 13, SpSM Annual 1, Marvel Two-in-One #69, and SpSM #38-40. This story takes place at some point after Peter has his own apartment. Need to check placement. After ASM #202 Spidey appears in SpSM #41, ASM #203, Dazzler #1-2, SpSM #42, Fantastic Four #218, and ASM #204-205. Collects ASM #206, 224-252, & Ann #16-17, SpSM #43-61 & 85, and material from ASM Ann 15, SpSM Ann 3, WoSM Ann 3, and What If #34. Collects The Amazing Spider-Man (1963) #238-239, 244-245, 249-251 and The Spectacular Spider-Man (1976) #43, 47-48, 85. Previously collected in a 1992 TPB of the same name, but with only #85 of the SpSM issues. MTU #70, 82-85, 96-113: Not collected except 100 in various (including Fantastic Four/Spider-Man Classic and Frank Miller, directly below), #101 & 111 in Essential Defenders Vol. 5, and #110 in Spider-Man/Iron Man: Marvel Team-Up. MTU essentials end with #98. This was a free anti-smoking issue, which is collected in Spider-Man Fights Substance Abuse. SpSM Ann 3 & 61-62. #229-230 in The Gauntlet, Vol 4, below. The sequence for this period is ASM #224-225, SpSM #63, MTU #114, SpSM #64, ASM #226, MTU 115-116, SpSM #65, Silver Surfer #14, Marvel Graphic Novel #1, Captain America #265-266, ASM #227, Fantastic Four #242-243, Defenders #107-109, SpSM #66, ASM #228 SpSM #67, Avengers #221, ASM #229-230, SpSM #68, MTU #117-119, SpSM #69-70, Dazzler #21, Marvel Two-in-One #90, MTU #120. MTU #121-125 & Annuals 5-6: Except #121 in Marvel Super Hero Team-Up, Annual 5 in Thing: The Serpent Crown Affair, and Annual 6 in Cloak and Dagger, above. After ASM #236, Spider-Man appears in Captain America #275, MTU #121, Contest of Champions #1-3, Hulk #277-279, Fantastic Four #250, Marvel Two-in-One Ann 7 & #96, MTU Ann 6 & #122-123, SpSM #72, MTU Ann 5, SpSM #73, MTU #124-125, ASM #237, SpSM #74, & ASM Ann 16. SpSM #75-89: Not collected (except Essentials, above) except for #81-82 in Cloak & Dagger: Crime and Punishment, and #85 in Origin of the Hobgoblin – both above. Secret Wars #1-12: See Marvel Universe Events: Secret Wars. Spider-Man plays a role through this series. The Amazing Spider-Man (1963) #252-259, 298-300, 315-317 and Annual 25; Fantastic Four (1961) #274, Marvel Super Heroes Secret Wars (1984) #8, and Web of Spider-Man (1985) #1. A prior 1988 & 1992 TPB collected just the #252-259 sequence. Also collects Annual 18-19 and Web of Spider-Man #1 & 6. MTU #146-150 & Annual 7: The series ends with #150. Also collected in the 2012 TPB Spider-Man: The Graphic novels. Also collects #134-136. First four issues also collected in a 1990 TPB of the same name. Secret Wars II #1-9: See Marvel Universe Events: Secret Wars II. Spider-Man appears in #2 and 7-9, plus several tie-ins. ASM #267, WoSM #5, SpSM #105-106, Code of Honor #4, Secret Wars II #2, WoSM #6. #273-274: Not collected, except #268 & 273-274 in Secret Wars II Omnibus, which also includes WoSM #6 and SpSM #111. All but #277 part of Flash Thompson Unmasked, not collected except for #276 & 278 in Captain America: Scourge of the Underworld. #282-289: Not collected except for #287 inSpider-Man by David Michelinie and Erik Larsen Omnibus and #289 in Kraven’s Last Hunt, below. 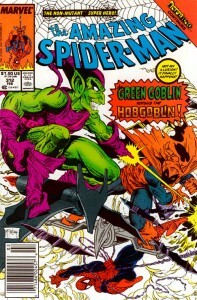 ASM #289 & WoSPM #29 cross over for Hobgoblin Revealed. SpSM #119-130: Not collected, except #128-129 in Silver Sable, above. WoSM #24-30: Not collected. 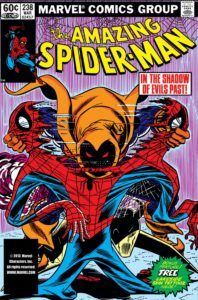 ASM #289 & WoSPM #29 cross over for Hobgoblin Revealed. ASM #289 & WoSM #29, WoSM #30, SpSM #127, WoSM #28, SpSm #128-129. This 1991 TPB collects The Amazing Spider-Man (1963) #290-292 & Annual 21 and Not Brand Echh (1967) #6. The Annual alone is collected in Marvel Weddings. The Amazing Spider-Man (1963) #293-294, The Spectacular Spider-Man (1976) #131-132, Web of Spider-Man (1985) #31-32. Also available in hardcover and collected in a 1990 TPB of the same name. SpSM Ann 7: Occurs after #294. Collected with Last Hunt Epic, above. 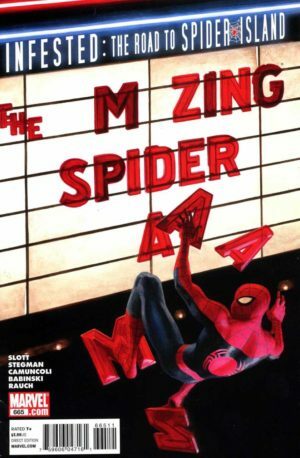 AKA Marvel Graphic Novel #46 Also collected in the 2012 TPB Spider-Man: The Graphic novels. Also collects SpSM Ann 10. Reprinted in 2018. 1990 TPB. Includes material from #298-299. Annual 22: See Marvel Universe Events: Evolutionary War. Also collects SpSM Annual 8 and WoSM Annual 4. Includes SpSM #146-148 and WoSM #47-48.In total: Power Pack (1984) #40 & #42-44, Avengers (1963) #298-300, Fantastic Four (1961) #322-324, Amazing Spider-Man (1962) #311-313, Spectacular Spider-Man (1976) #146-148, Web of Spider-Man #47-48, Daredevil (1964) #262-263 & 265, Excalibur (1988) #6-7, and Cloak & Dagger (1988) #4. Re-issued in 2016 in paperback without the Power Pack, Excalibur, and Cloak & Dagger issues. #320-325 (inclusive of #324) were also collected in a 1992 The Assassin Nation Plot TPB. #317 is also in The Very Best of Spider-Man, above. Annual 23: See Marvel Universe Events: Atlantis Attacks. Also collects SpSM Annual 13 and WoSM Annual 5. The Captain Universe backup from WoSM is included in Captain Universe: Power Unimaginable. SpSM #151-157 & WoSM #49-58: Not collected. There is a crossover between SpSM #153-154 & WoSM #53-54. Collects Amazing Spider-Man #326-333 & Annual 24, Spectacular Spider-Man #158-160 & Annual 10, Web of Spider-Man #59-61 & Annual 6. A 1993 TPB version included the full SpSM and WoSM runs but stopped at ASM #329 and did not include any of the Annuals. That same run of issues is duplicated within the Acts of Vengeance omnibus. Also collects material from Amazing Spider-Man Annual 1. Also collected in a 1994 “Return of” TPB, sans Annual. Reprinted in 2018. Also collects X-Force (1991) #4 and Spider-Man/Deadpool #1-6. It’s unclear what that Deadpool series refers to, as Todd never pencilled one by that name. Collects Fantastic Four #334-336; Wolverine (1988) #19-20; Dr. Strange (1988) #11-13; Incredible Hulk #363; Punisher #28-29; Punisher War Journal #12-13; Marc Spector: Moon Knight #8-10; Daredevil #275-276; Power Pack #53; Alpha Flight (1983) #79-80; New Mutants #84-86; Uncanny X-Men #256-258; X-Factor #49-50; Web of Spider-Man #64-65; and the Damage Control mini-series. Reading order: ASM #334-339, Avengers #314-318, Impossible Man Summer Vacation Spectacular, SpSM #165-167, SpM #1-5, Thor #427, WoSM #64-68, Uncanny X-Men Annual 14, WoSM #69-70, SpSM #168-170, Deadly Foes of Spider-Man #1-4, Moon Knight Vol. 3 #19-21, Marvel Comics Presents #67/4. 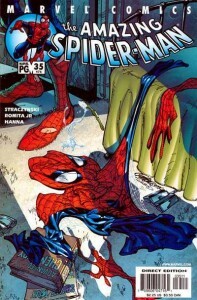 ASM #340-343: Powerless (except #340) – In Epic, above. 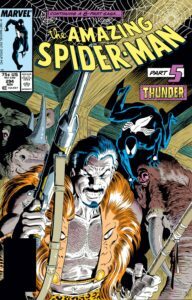 This is tricky – #346-347 are collected in Vengeance of Venom, above, but they aren’t the entire story – which was collected over twenty years ago in the 1993 “Venom Returns,” also above. ASM #344-347, SpSM #173, SpM #6-7, Avengers #329-330, SpSM #174-175, Darkhawk #2-3. 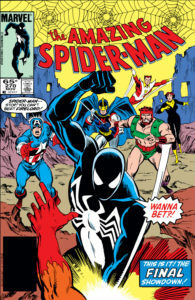 ASM #348: Spider-Man: Am I an Avenger? The Amazing Spider-Man (1963) Annual 03 & #348, Avengers (2010) #1, The Avengers (1963) #236-237, 314-318, & 329, and New Avengers (2005) #3. SpSM #176-177 & Annual 11: Not collected, except for portions of annual, below. WoSM #73-89 & Annual 7: Not collected, except for portions of annual, below. A three-part story from ASM Annual 25, SpSM Annual 11, and WoSM Annual 7. Material from these stories are collected above in Vengeance of & Return of Venom, respectively, as well as Epic Vol. 22, below. SpM #17: Not collected. An Infinity Gauntlet tie-in. In Epics, but #349-350 were also in a 1995 Spider-Man vs. Doctor Doom TPB. Also uncollected are SpSM #178-184 and WoSM #77-81. #353-358: Round Robin: The Sidekick’s Revenge! Collected in Epic, above, plus a 1994 TPB. See initial listing above for full collection info. 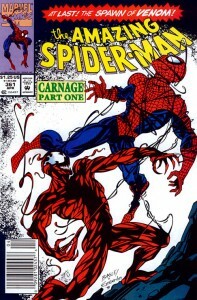 Also collected in a 1993 Carnage TPB. Collects an annuals crossover between ASM Annual 26, SpSM Annual 12, WoSM Ann 8, and New Warriors Annual 2. Also collected in New Warriors Omnibus, Vol. 1. Some back-up material from these annuals is included in The Vengeance of Venom, above. Spider-Man #24: Infinity War tie-in – see Marvel Universe Events: Infinity War for collection information apart from Spider-Man collections. Not collected, except for #365 in Very Best of and Visionaries: John Romita Sr., both above. Also uncollected are SpSM #191-196, WoSM #93-96, SpM #25-31, except for SpM #25 in Avengers Academy 2.5: Arcade – Death Game and the four issues of the WoSM & Spirits of Vengeance crossover in a 1993 TPB. Not collected aside from a 1995 TPB and #373 in Vengeance of Venom, above. Not collected, except #374-375 in Vengeance of Venom, above. Also uncollected are SpSM #197-200, WoSM #97-100 & Annual 9, and SpM #32-34, except for SpSM #200 in Son of the Goblin, above. The Amazing Spider-Man (1963) #378-380, The Spectacular Spider-Man (1976) #201-203, Spider-Man (1990) #35-37, Spider-Man Unlimited (1993) #1-2, Web of Spider-Man (1985) #101-103. Spider-Man: The Mutant Agenda #0-3: Collected in TPB along with Marvel Team-Up #90. Not collected. Also uncollected are SpSM #209-210, WoSM #109-111, SpM #44 – except for #388 in Vengeance of Venom, above. Collects most of the material from the first three Ben Reilly trades, with the exception of New Warriors #65-66. Collects Web Of Scarlet Spider #1-4, Amazing Scarlet Spider #1-2, Scarlet Spider (1995) #1-2, Spectacular Scarlet Spider #1-2, Scarlet Spider Unlimited #1, Green Goblin #3, Sensational Spider-Man (1996) #0-3 and Wizard Mini-comic, Amazing Spider-Man (1963) #407-410 & Annual ’96, Spider-Man (1990) #64-67, New Warriors (1990) #67, Spectacular Spider-Man (1976) #230-233, Spider-Man/Punisher: Family Plot #1-2, Spider-Man Holiday Special 1995, Spider-Man: The Final Adventure #1-4, Spider-Man Unlimited (1993) #11, Spider-Man Team-Up #2-3 and material from Venom: Along Came A Spider #1-4. The Amazing Spider-Man (1963) #394, The Spectacular Spider-Man (1976) #217, Spider-Man (1990) #51-53, Spider-Man Unlimited (1993) #7, Spider-Man: The Lost Years (1995) #1-3, Web of Spider-Man (1985) #117-119. Reprinted in 2016 as ISBN 978-1302903183. The Amazing Spider-Man (1963) #395-399, The Spectacular Spider-Man (1976) #218-221, Spider-Man (1990) #54-56, Spider-Man Unlimited (1993) #8, Spider-Man: Funeral for an Octopus (1995) #1-3, Web of Spider-Man (1985) #120-122. Reprinted in 2017 as ISBN 978-1-302-90366-4. Spider-Man also makes guest appearances around the time of ASM #398 in Morbius #29, Secret Defenders #25, Spider-Man: Friends & Enemies #1-4, Darkhawk #50, Marvel Holiday Special #94, and after SMU #8 in Spider-Man: The Power of Terror #1-3, and Spider-Man: Legacy of Evil. The Amazing Spider-Man (1963) #400-401 & Super Special #1, The Spectacular Spider-Man (1976) #222-224 & Super Special 1, Spider-Man (1990) #57-58 & Super Special 1, Spider-Man Unlimited (1993) #9, Spider-Man: The Clone Journal (1995) #1, Venom Super Special (1995) #1, Web of Spider-Man (1985) #123-124 & Super Special 1. Reprinted in 2017 as ISBN 978-1-302-90367-1. Reprinted in 2017 as 978-1302903671. The Amazing Spider-Man (1963) #402-404, The New Warriors (1990) #61, The Spectacular Spider-Man (1976) #225-227, Spider-Man (1990) #59-61, Spider-Man: Jackal Files (1995) #1, Spider-Man: Maximum Clonage (1995) Alpha & Omega, Web of Spider-Man (1985) #125-127. Reprinted in 2017 as ISBN 978-1302903688. Spider-Man also makes guest appearances after #403 in Spider-Man: The Osborn Journal. The Amazing Spider-Man (1963) #405-406 & Super Special #1, The New Warriors (1990) #62-64, The Spectacular Spider-Man (1976) #228-229 & Super Special #1, Spider-Man (1990) #62-63 & Super Special #1, Spider-Man Team-Up (1995) #1, Spider-Man Unlimited (1993) #10, Venom Super Special (1995) #1, Web of Spider-Man (1985) #128-129 & Super Special #1. Reprinted in 2017 as ISBN 978-1302903695. For placement of the flashback series Untold Tales of Spider-Man, see Silver Age. It is collected in total in an omnibus. Spider-Man also makes guest appearances after SpSM #229 in Daily Bugle #1-3. Spider-Man also makes guest appearances after SpM #66 in Venom: The Hunted and after SpSM #233 in New Warriors #70-71. He appears before ASM #413 in Avengers #400. Spider-Man also makes guest appearances after ASM #415 in Fantastic Four #416 and after ASM #416 in Green Goblin #13, both a part of Onslaught. For more information see Marvel Universe Events: Onslaught. ASM #419-431: Not collected, except #420 in X-Man: Dance With the Devil. Also not collected are Spider-Man Team-Up #6, The Sensational Spider-Man #12-24, Spider-Man #76-88, and the Spectacular Spider-Man #242-253 – except Sensational Spider-Man #13-15 in a 1997 TPB of Spider-Man: Savage Land. The Marvel “-1” flashback month occurred here; Spider-Man stories from ASM, SpM, and SenSM were all set in flashback near Spidey’s debut. ASM #429, X-Man #35, Heroes Reborn: The Return #1, Marvel Team-Up Vol. 2 #4-5, Heroes Reborn: The Return #2-4. ASM #436-439: Not collected, along with Spider-Man #93-95 and Sensational Spider-Man #29-31. Collects The Amazing Spider-Man (1999) #1-6 & Annual 99, Peter Parker: Spider-Man (1999) #1-6, and Thor (1998) #8. Amazing Spider-Man: Toy Fair Special (1999) #1 was released around this time; it is likely not in continuity. Webspinners: Tales of Spider-Man #1-18 was launched in 1999, but the stories occur variously at other points of continuity. It is collected in its entirety in Spider-Man: Webspinners – The Complete Collection along with material from Shadows & Light (1998) 2-3. 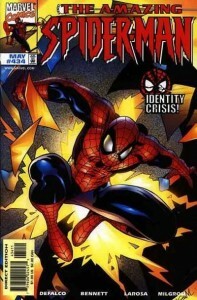 Collects The Amazing Spider-Man (1999) #7-12 and Peter Parker: Spider-Man (1999) #7-12 & Annual ’99. 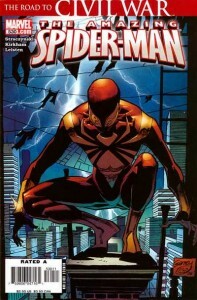 Collects The Amazing Spider-Man #13-19 & Annual 2000, Peter Parker: Spider-Man (1999) #13-19, and Spider-Woman (1999) #9. PPSM Annual 1 & #23-24: Not collected. #24 is part of Maximum Security. After Maximum Security: Sentry #3-5 and Sentry team-up issues /FF, /Hulk, /Spider-Man, /X-Men, and /Void. Wolverine #156-157. He then appears in ASM #36 (9/11 issue), followed by SMU #15/2 from ’06. Some of the initial action occurs in parallel to PPSM #23-24. Collects The Amazing Spider-Man (1999) #25, Peter Parker: Spider-Man (1999) #25, and Spider-Man: Revenge of the Green Goblin (2000) #1-3. #30-33 occur after ASM #30, below. #34 fall after Tangled #34. #1-3 directly follow Annual 2001. #4-6 follow PPSM #33. Also collected in Spider-Man’s Tangled Web Omnibus (2017). Spider-Man Activision #0: Not collected. Despite presumably existing outside of continuity, this GamePro Magazine #147 freebie was written by Brian Bendis! Spider-Man vs. Punisher (2000): Not collected. One-Shot. Need to check placement. Year In Review: Spider-Man (2000) AKA Peter & Mary Jane’s Spider-Man Scrapbook: Not collected. May be reprint material. This run of Amazing was recollected in Ultimate Collections, which are effectively double-length TPBs. Also collects Friendly Neighborhood Spider-Man (2005) #24, The Sensational Spider-Man (2006) #41, and Spider-Man: One More Day Sketchbook (2007). This series of hardcovers effectively continues into The Other hardcover, below. As originally collected, including other Spider-Man series from this time period. After #38: Tangled #13, PPSM #38-39, Tangled #12, PPSM #40-1, Defenders #9-10, Spider-Man: Sweet Charity, PPSM #42-43, Spider-Man/Daredevil #1 (collected with Spider-Man/Wolverine (2003)), Venom #11, Avengers #51 (flashback), Daredevil #34-35, Order #5-6, Venom #10, PPSM #44-49, Venom #14-18, Alias #15 (single panel), Tangled #18. Spider-Man Unlimited #1-15: Not collected. Need to confirm placement. Also skips ahead to collect #48-50, which is why it’s titled Vol. 4. Peter Parker: Spider-Man #36: ? Spider Man’s Tangled Web #7-11: Vol. 2 – Also collected in Spider-Man’s Tangled Web Omnibus (2017). Spider-Man’s Tangled Web #12-17: Vol. 3 – Also collected in Spider-Man’s Tangled Web Omnibus (2017). Spider-Man’s Tangled Web #18-22: Vol. 4 – Also collected in Spider-Man’s Tangled Web Omnibus (2017). Released here, but unsure of placement (or if it is in continuity): Startling Stories: Megalomaniacal Spider-Man (2002) – #1 (collected later in Strange Tales (2009). Need to check placement: Kingpin (2003-2004) #1-7. Spider-Man appears throughout. Also collects Peter Parker: Spider-Man#39-41, from two years prior. A very delayed six-issue mini-series started by Kevin Smith in 2002 and completed in 2005. Need to check placement. Spider-Man: Breakout (2005) #1-6 – A limited series that links to Spidey’s joining New Avengers. Need to check placement. Spider-Man: India #1-4 fit somewhere near here and are collected in TPB, as does Toxin collected in TPB. Need to check placement of both. 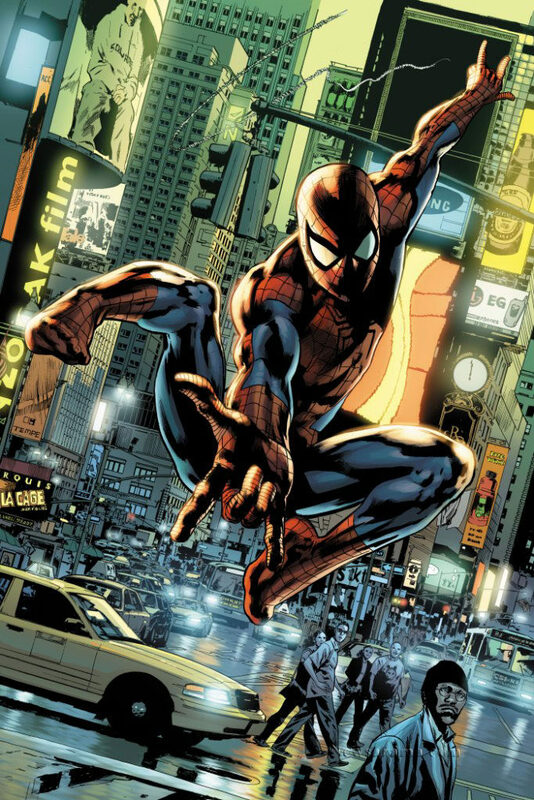 House of M: Spider-Man appears in this story, as well as in a connected five-issue limited series. It does not directly impact his continuity, but he remembers the events. See Marvel Universe Events: House of M.
Friendly Neighborhood Spider-Man (2005) #1-4 and Marvel Knights Spider-Man (2004) #19-22. Available in hardcover. Continued from Marvel Knights Spider-Man. Available in hardcover. Civil War: Spider-Man plays a pivotal role in the Marvel Civil War event. All of Spider-Man’s issues are collected in a single oversized hardcover – Civil War: Spider-Man. For specific issue information and more on the event, see Marvel Universe Events: Civil War. Spider-Man and The Fantastic Four #1-4: Collected in TPB, but not set at this time. This story is a future tale not in continuity. Available in TPB and hardcover. Also collects Friendly Neighborhood Spider-Man (2005) #17-23 and Annual 1. Available in hardc0ver. Cover actually reads “Peter Parker Spider-Man” to differentiate it from the other “Back in Black” collection directly above. Also collects Annual 1, Marvel Spotlight: Spider-Man (2007) #1, The Official Handbook of the Marvel Universe: Spider-Man: Back In Black Handbook (2007) #1, and Spider-Man Family (2007) #1-2. Available in hardcover. Collects the continuity-smashing story that soured longtime Spider-Man fans, which crossed over into Friendly Neighborhood Spider-Man (2005) #24 and The Sensational Spider-Man (2006) #41. Available in hardcover. One More Day did two major things to reset the status quo, which was a sort of good new / bad news combo for fans. First, it hit the reset button on some of Spidey’s continuity, including the revelation of his identity to the public and the seriousness of his relationship with Mary Jane. This effectively de-aged the character without making him young, better aligning him the fun and carefree Peter Parker of the cartoons and movies. As you can imagine, most fans disliked that change. However, the second one was much better received: multiple titles were condensed down just to Amazing, which accelerated to a bi-weekly production schedule with a rotating cast of writers. This was a genius decision by Marvel, even if it was copying a move from DC’s recent playbook of releasing weekly series for an entire year at a time. 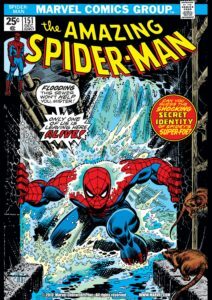 This was different – focusing all of the resources of the entire line of spider-books on a single title meant Spidey’s adventures could move quickly and keep fans regularly sated while being easy to follow. Also includes The Amazing Spider-Man: Swing Shift Director’s Cut (2008) [Ed. 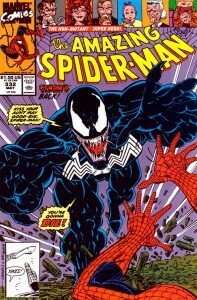 Note: Which is a slightly expanded version of Free Comic Book Day 2007] #1 & Venom Super Special (1995) #1. Available in hardcover. Also includes a story from The Amazing Spider-Man Extra! (2008) #1. Available in hardcover. Also includes Annual 35. Available in hardcover. Not the 2011 Fear Itself event! I need to recheck where this is collected. Collects The Amazing Spider-Man: Presidents’ Day Celebration (2009) #1, the second story from #583, and material from The Amazing Spider-Man: Extra! (2008) #1 & 3. Available in hardcover. Also collects material from Amazing Spider-Man Extra #2. Available in hardcover. Also collects material from Amazing Spider-Man Extra #3. Available in hardcover. Also includes Annual 36, and material from Amazing Spider-Man Family #7. Available in hardcover. Also includes material from Web of Spider-Man #1. Available in hardcover. Also includes Dark Reign: The List – Amazing Spider-Man and material from Web of Spider-Man #2. Available in hardcover. Also collects material from Web of Spider-Man #3-4. Available in hardcover. Also collects material from Web of Spider-Man (2009) #2 and 5. Available in hardcover. Also includes the classic issues #229-230. Available in hardcover. Also includes Web of Spider-Man #6. Available in hardcover. Also includes Web of Spider-Man (2009) #7 and material from Spider-Man: Origin of the Hunter. Available in hardcover. This six-issue Jason Aaron series was released around this time, but I need to check where it fits in continuity. Available in hardcover. An arc revisiting and clarifying the events of the hugely controversial One More Day. Available in hardcover. Written by Mark Waid. Also includes back-up stories and Web of Spider-Man (2009) #12. Available in hardcover. Flashback stories that continue through to present day by issue #4. Also collects Fantastic Four (1961) #218 & The Spectacular Spider-Man (1976) #42. Available in hardcover and TPB. Flashback stories that continue through to present day by issue #4. 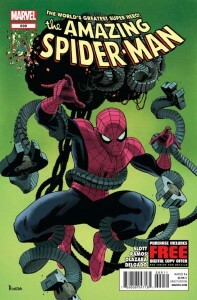 Dan Slott takes over as the full-time scribe of Spidey’s bi-weekly comic book, amassing over fifty issues in two years. This run of Amazing is in the process of being recollected in Ultimate Collections, which are effectively double-length TPBs. This hefty TPB covers the entire arc of Dan Slott’s exclusive tenure on Amazing Spider-Man, which sees Peter Parker finally achieving some success professionally and as a superhero. Also collects Amazing Spider-Man: Infested #1, FCBD 2011, and Spider-Island: Deadly Foes #1. Spider-Man joins the Fantastic Four just after #657 in Fantastic Four #388 & FF #1 (actually, he joins The Future Foundation – but, it’s best to let you understand it when Spidey does). Also includes Spider-Man’s Free Comic Book Day issue from 2011. Available in hardcover. Spectacular Spider-Man #1000 (2011): One-shot team-up with Punisher. Not collected. Need to check placement. Fear Itself: Spider-Man #1-3: See Marvel Universe Events: Fear Itself for collection information. This Christopher Yost story occurs after Spidey joins the FF, but prior to Spider-Island. Collects event issues Venom #6-9, The Amazing Spider-Man: Infested (2011) #1, and Spider-Island: Deadly Foes (2011) #1. Also available as an oversized hardcover. Avenging Spider-Man (AvSM) is introduced here – a team-up book allowing Spidey to interact with the wider Marvel Universe while his own plots rocket forward at breakneck speed in Amazing. Title is referred to as AvSM. Collects a crossover to Daredevil #8. Available in hardcover. Written by Zeb Wells. Also available in hardcover. The initial #1-3 arc is also collected along with another Joe Madureira Spidey/Wolverine team-up in Spider-Man by Zeb Wells & Joe Madureira. Collects a crossover with Daredevil #11 and Punisher #10. Also includes Daredevil #12-15. Available in hardcover. Daredevil is a great match in tone to Spider-Man, but if you prefer you can also pick up this story in The Punisher by Greg Rucka, Vol. 2. Also collects Ends of the Earth #1 and Avenging Spider-Man #8. Available in oversized hardcover. Also collects Untold Tales of Spider-Man #9. Available in hardcover. Peter Parker: Spider-Man 156.1 was released around this period. It’s continuity is unclear. Also collects Avenging Spider-Man #11. Available in hardcover. Also includes Annual 1, Amazing Spider-Man #692 & Annual 39, and Spider-Man vs. Vampires. Avengers vs. X-Men: Since this story marks the start of Marvel Now, it effectively occurs just prior to Dying Wish. 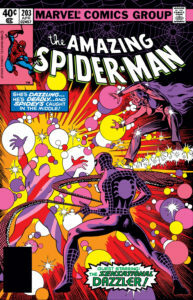 Though he did not appear significantly in tie-ins to this event, Spider-Man plays a key roll in the middle portion of the mini-series (issues #5-9). See Marvel Universe Events: Avengers vs. X-Men. Also available in hardcover, and oversize hardcover below with Superior Spider-Man. 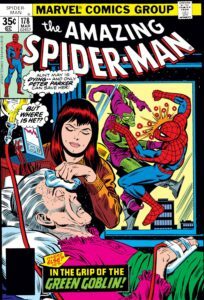 The point-one issue of Spider-Man branched from the Dying Wish storyline to act as backdoor pilot for a short-lived Morbius series in Marvel Now. Collected alongside Morbius #1-9. Marvel continues to publish Peter Parker Spider-Man stories that occurred sometime in this period. 2013-2014: Marvel Knights Spider-Man – A five-issue limited series by acclaimed indie creator Matt Kindt. Spider-Man continues its twice-monthly pace under the regular direction of Dan Slott. With the major change in status quo that lead to this relaunch as Superior Spider-Man you might think Slott was out of surprises, but the entire run was full of thrills. Also collects Amazing Spider -Man 698-700. #15.1 acts as a prologue to the Superior era of Spider-Man. Writer Chris Yost’s starts to build a meta-arc about The Sinister Six and the Jackal throughout these stand-alone stories. 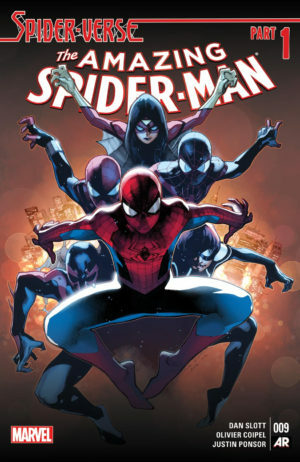 Originally conceived as a second arc of Avenging Spider-Man, instead this story has been updated to include the Superior Spider-Man. Unsure of continuity placement. Spider-Man plays a consistent supporting role throughout this collection. Also available in hardcover. Infinity: Spider-Man appears in some Infinity tie-ins. See Marvel Universe Events: Infinity. Peter Parker as we know and love him returns in a new Amazing Spider-Man volume in the wake of Superior Spider-Man, but it’s short-lived due to the interruption of Secret Wars. An original story by Mark Waid. Confirmed by Tom Brevoort to occur after the switch back to Peter Parker in 2014 (rather than prior to Superior). Reprinted as a paperback in 2018. This six-issue series is Spider-Man at his wisecracking best as he shuttles around a class of mutant delinquents. It occurs after Peter’s return and The Death of Wolverine, but before Spider-Verse – which seems to place it here. Also collects Superior Spider-Man #32-33, plus material from Free Comic Book Day. Spider-Woman spins off to her own title here – see Spider-Woman. Spider-Verse: The main collections of Spider-Verse are listed below. The tie-ins to this event are contained entirely in two books, but I’ve included more information at Marvel Universe Events: Spider-Verse. Collects Amazing Spider-Man #7-15, Superior Spider-Man #32-33, Material from Free Comic Book Day 2014, Spider-Verse #1-2, Spider-Verse Team-Up #1-3, Scarlet Spiders #1-3, Spider-Woman #1-4, Spider-Man 2099 #6-8. Available in oversize hardcover. And, believe it or not, this massive tome isn’t the entire story – you also need to pick up Amazing Spider-Man: Edge of Spider-Verse for lead-in stories including the introduction of Spider-Gwen. Both Silk and Spider-Gwen spin off to their own titles here. Contains specials from each of the titled heroes. Secret Wars: Spider-Man appears in several series, notably Renew Your Vows #1-5 written by Dan Slott. See Marvel Universe events for more information. Renew Your Vows continues in its own continuity in Vol. 1: Brawl in the Family collecting #1-6. In the wake of Secret Wars, Peter Parker is in control of his life and more successful than ever. A surging Parker Industries means he not only doesn’t need to worry about money, but is recognized for his scientific genius. Peter Parker appears regularly in Amazing Spider-Man (ASM) and Spider-Man/Deadpool (SpM/DP). See the Guide to Miles Morales, Spider-Man for collections of Spider-Man (2016). Issue #8 is the conclusion of the first arc. This collect skips the arc in #11-12, which is in the prior collection, and #15-16, which is a crossover. These are the confirmed contents! This era also includes tales of Peter Parker’s younger years, which are not in present-day continuity. Confirmed this issue range in the actual book! This not only wraps up this titles mega-arc in #307, but includes the final three issues of Zdarsky’s run – #308-309 are a two-part Sandman story, and #310 is a standalone both written and illustrated by Zdarsky. After hundreds of issues written by Dan Slott with the occasional co-write by Christos Gage, Nick Spencer takes over the title with artist Ryan Ottley (fresh from his historic run on Robert Kirkman’s Invincible). Chip Zdarsky’s Peter Parker, The Spectacular Spider-Man also continues into this period beginning with issue #308. Also collects the Spider-Man story from Free Comic Book Day 2018. Despite being solicited in some places as starting from #308, this actually picks up after the end of Chip Zdarsky’s run. Collects a Dora Milaje story from Wakanda Forever: Amazing Spider-Man #1, Wakanda Forever: X-Men #1, and Wakanda Forever: Avengers #1. Spider-Man stars only briefly, assisting a pair of Dora Milaje in fighting Hydro-Man. Collects Edge of Spider-Geddon (2018) #1-4, Four one-shot stories giving us a glimpse of where our multi-version Spider-People have been since Spider-Verse. 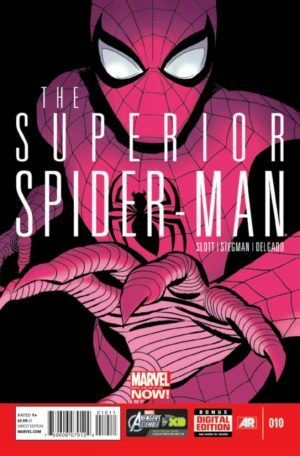 This is solicited to also include Superior Octopus (2018) #1. Billed as a “hyper-local” version of Spider-Man. Check Amazon for Marvel’s newest Spider-Man titles. I was wondering if you knew of any books that would collect the “major” or “essential” or “best” Spider-man stories. * Whatever Happened to Crusher Hogan? All I can say is that these stories definitely ARE classic, but because of when they were collected the list is a very 90s-centric view of what comprised the best of Spider-Man. There have been a lot of major, essential stories since then in the 90s and 00s (and many would likely nominate Ultimate Spider-Man into that list). I love the work you do. I notice while going down the Spider-man reading order that one particular oversized hardcover was missing. The Marvel Knights Collection by Mark Millar: https://www.amazon.com/Marvel-Knights-Spider-Man-v-1/dp/078511842X. Its in a trade now as you know, but just wanted to point this out in case anyone wanted to hunt down an HC. Thanks, Paul! Somehow I had a lot of trouble with those mid-00s OHCs of Spider-Man, as I was missing the “Best of” series too until a reader pointed them out. I’ll add the oversized Millar in my next update. There’s also Spider-Man Family (2007), the predecessor to Amazing Spider-Man Family, that was collected in digests: 1-3 in Spider-Man Family: Back in Black, 4-6 in Spider-Man Family: Untold Team-Ups and 7-9 in Spider-Man Family: Itsy-Bitsy Battles. As you can tell I do my own bit of cataloging of Spider-Man comics, and your site has been a great resource for it! Thanks for all the hard work, and I always look forward to checking out your new content!